Open every day except Saturday. The entrance fee for divers is 8 USD. Only divers with registered dive shops can dive this site. Toilets are available. There is a large parking area with tables to set up dive equipment. It is a very easy 10m/30ft walk down a concrete stairway to the water from the parking area. Permanent Gold Cavern line. Maximum depth 15m/50ft. Halocline depth 12m/40ft. Ponderosa is located 10 minutes south of Puerto Aventuras on Highway 307 very close to the entrance of Chikin Ha. From the turnoff a very good 1.6km/1mile dirt road leads out to the car parking area 5 minutes into the jungle. Ponderosa is a very popular site for snorkeling as well as Cavern and Cave Diving. It is also a popular training site and you may well get to see a cave class being taught while you are there. Ponderosa is a very large open cenote with crystal clear water and lots of life hiding among the large blocks of collapsed algae covered limestone. Look out for the Sail fin Mollies, Cichlids, freshwater Eels and Turtles. You will also see plenty of bird life in and around the cenote including Motmots, Cormorants, and Grebes. If you are lucky you may get to see the Grebes diving and chasing the brightly colored shoals of fish underwater. The shallow depths make this an ideal location for snorkelers and for those brave enough there is the added adventure of making a daring leap of 5m/15ft from the edge of the cenote into the water. But please mind the divers! The entrance to the Cavern Zone of Ponderosa is huge and the permanent gold Cavern Line begins a little way in so your guide will run a Primary Reel from the open water to the start of the permanent line. Once at the start of the line you will be able to clearly see light ahead of you from Cenote Corral 90m/300ft away showing just how good the visibility is here in the caverns of the Riviera Maya. A very large impressive tunnel leads from Ponderosa over to Corral so big you could fly a 747 through it. Once you reach cenote Corral the Cavern Line skirts the edge of it giving you a great view of both the cavern below and jungle above with very impressive light shows. In several areas you will encounter a strong and defined halocline that is great fun to dive in and out of. Look out for the ethereal wispy layer of hydrogen sulphide trapped in a density interface in the water column at the far end of the cavern zone. 15 meters / 50 feet. El Eden together with Cenote Coral really show their beauty on sunny days. A beautiful place to shoot. 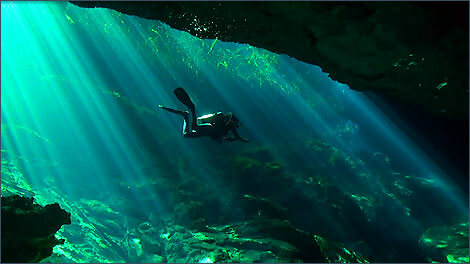 The sun beams and the animals make this cenote very special.